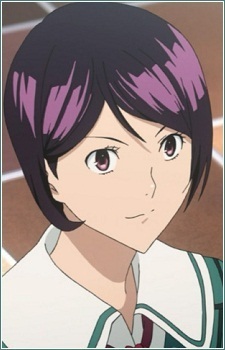 Iwase is an intelligent girl who was a classmate of Mashiro and Takagi during Junior High. Iwase is an academic achiever in school. She's difficult to get along with due to her strict and high-standard nature. She leads a rather lonely life however, this doesn't bother her as she's always focused on her studies. In her world, she only respects people that rivals her ranking in school. When she appeares with Miyoshi Kaya at Takagi's house after his suspension, she reveals that she liked him. She took notice of Takagi during their middle school days as the only person that managed to out-rank and out-score her in academic performance. For her, giving out a simple hand-shake was a huge deal, as it meant a physical sign of respect and even going out together. However, she was so subtle to Takagi that she entirely missed the chance to properly convey her feelings. Her occasional mouth of challenge to Takagi only suggested to him to maintain this one-sided rivalry, but in reality, she was encouraging him in her subtle romantic intentions. Things started to change when she realized Takagi dropped in his school ranking and even stopped caring about his scores. When he was pressed to choose between her and Miyoshi, Takagi made it clear he's focused on being a mangaka more than romance. When Iwase tells Takagi to not pursue his ambitions and instead continue their academic rivalry she, to her surprise, was rejected by him. She reappears in chapter 60 as a student at To-oh University and novel writer. Iwase worked in publishing to prove her line of literary works are superior to Takagi, but unfortunately, it was another unofficial rivalry that he didn't realize until she pointed it out later. Iwase however, still she sees Takagi as a rival and decides to write stories for Shonen Jump to see if she can beat him at his own game. Her editor is Hattori, who worked with Takagi and Mashiro. She later becomes the writer for Eiji's new manga +Natural. She also teams up with Eiji for a collaboration in Crow for a few chapters. After Hattori returns as Takagi and Mashiro's editor, her new editor is Miura. Her writing and plot are praised for being very well made.